In Team Policy Debate, two teams consisting of 2 students each assume opposing sides (Affirmative and Negative) in a topic concerning US government policy. 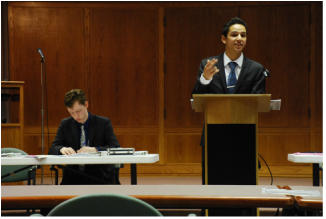 The topic is one that students will have derived from a resolution determined prior to the school year by Stoa, the nationwide homeschool Christian debate organization with whom Verve is affiliated. to solve that problem, and compelling evidence supporting why their plan will be beneficial. In addition, students will prepare to be the Negative team against a wide variety of Affirmative cases. In this scenario, the team will prepare "briefs" to defend against any Affirmative case presented. Similar to an Affirmative case, a Negative brief will contain compelling evidence refuting the Affirmative team's position and suggesting no change is necessary, that staying with the status quo is the best solution. 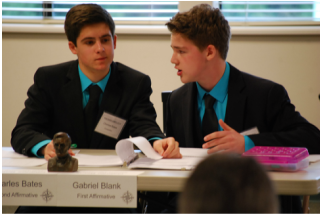 In both the Affirmative and Negative positions, students will learn to work as a team -- in researching and preparing their case, in presenting their position during the debate, and in learning to make adjustments after the debate to improve their overall performance. Individually, the students learn to "think on their feet" -- to evaluate an argument and evidence critically, quickly prepare a counter-argument, and present their argument with professionalism, respect, and confidence.